Ben Slater will join Nottinghamshire on loan until the end of the year, subject to ECB approval, with the 26-year-old signing a three-year deal from the start of next season. Slater has been in fine form in the Specsavers County Championship in 2018, scoring 676 runs at an average of 42.25, including six half centuries. The Chesterfield-born left-hander added a further 386 runs in eight games, with an average of 55.14 in the Royal London One-Day Cup group stages. 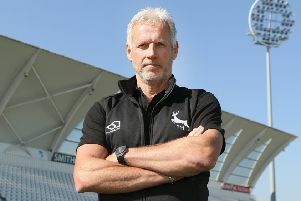 Slater, who has scored over 5,000 career runs to date, is now relishing the chance to join up with the Nottinghamshire squad and hopes he can contribute to winning trophies in the upcoming years. “I’m looking forward to joining with Nottinghamshire and having the chance to play at Trent Bridge week in week out,” said Slater. “The squad is full of international quality and I’m excited to continue my development alongside some top-class batsmen. Slater will add competition to a batting line up that already includes the likes of Steven Mullaney, Samit Patel, Riki Wessels and Jake Libby, and director of cricket Mick Newell believes he will thrive in his new surroundings. “Ben is someone who has grown his game year on year since his debut and over the past summer has started to show a real consistency at the top of the order,” said Newell. “Obviously after losing a number of batsmen over the past couple of years we’ve been quite open in our need to strengthen in that department and Ben certainly fits that bill.